"More and better jobs" is the underlying theme of this insightful new book. David Levine analyzes the current labor market in the U.S. and concludes that social policy must change to cope with the realities of the new economy. Although market forces are now moving U.S. enterprise toward high-skill and flexible workplaces, there is a shortage of workers with adequate skills in problem solving and teamwork. 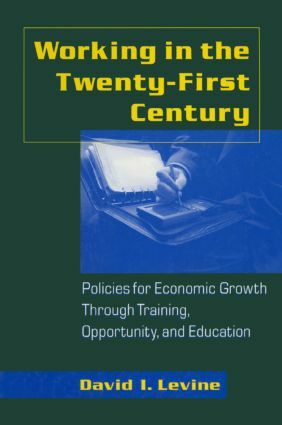 To combat this problem, the author presents an ambitious agenda of lifelong learning that will enable American workers to take advantage of the opportunities afforded by the new economic realities. Levine's analysis recommends specific government policies to encourage early childhood education, to improve schools, to help parents finance college, and to help students make the transition from school to work. He also discusses policies that will improve the regulation of workplaces. The book concludes with policy recommendations for individuals changing jobs, as well as for the unemployed, the disabled, and the poor. A concise introduction to the basic elements of argumentative prose and the conceptual tools necessary to understand, analyze, criticize, and construct arguments: as well as to the philosophical mainstays of metaphysics, epistemology, and philosophical analysis.